I know, could there be a more ambiguous recipe title? I mean, is it fajitas, grilled chicken, or a cheeseburger!?! Yes! We were in the middle of the "after-Thanksgiving/Black Friday lull" and I wanted to grill something different to eat while watching the exciting rivalry games this past weekend. I was staring at plain boring chicken and this is what I came up with. Served with sweet potato fries. What? You have never drank from a mason jar? I used a fajita marinade to add flavor to the chicken. I butterflied the breasts to shorten marinade and cooking times since I didn't want to miss the action. 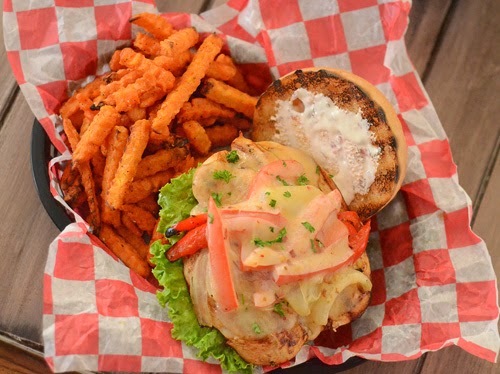 I topped it with pepper-white cheddar cheese and served it on a crispy toasted kaiser roll like a burger. Mix the marinade together. Place the chicken and 2/3 cup of the marinade in a gallon ziptop bag. Place the onion, bell pepper, and 1/3 cup of the marinade in a quart zip top bag. Massage to coat well and refrigerate for 2-4 hours. 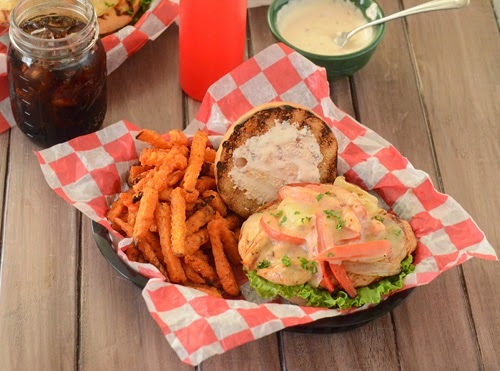 Mix together the hot pepper mayo ingredients and refrigerate at least 1 hour prior to serving. Preheat your grill to 400f. Clean and lube the grill grates. Remove the veggies and place on a 12" x 24" piece of heavy duty aluminum foil. Fold the foil over and seal to make a packet. Grill until the veggies are tender, about 6 minutes per side. Remove the chicken from the marinade and grill for 4 minutes on one side. Flip and top with some of the peppers and onions (be careful and use tongs to open your foil pack), cook for 3 minutes. 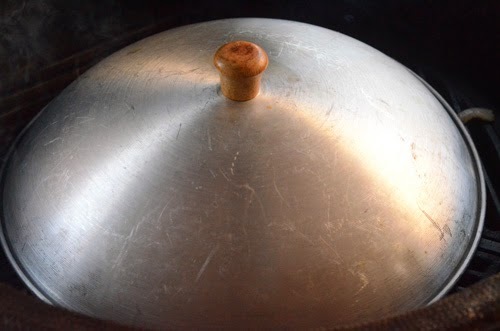 Top with slices of cheese and cook another minute to melt cheese (use wok dome as shown below if desired). Check the internal temperature to make sure the chicken has reached 160f and then remove from grill. 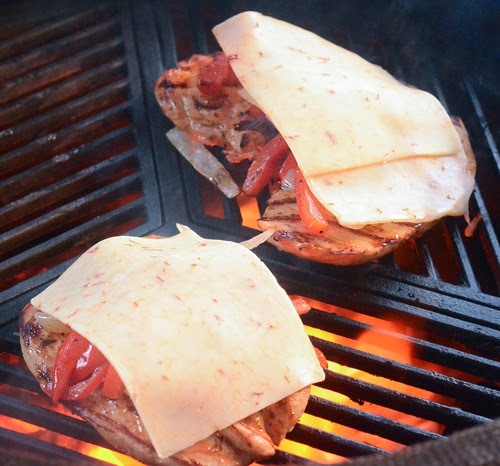 Serve on toasted kaiser rolls slathered with the hot pepper mayonnaise. 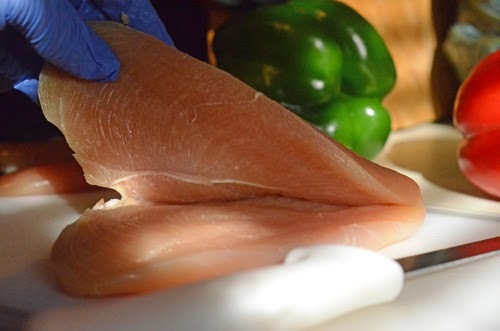 If your butcher won't butterfly the chicken breasts for you, it's easy to do yourself with a sharp knife. Just remove the tenderloin from the back. Slice almost through to the other side, open like a book and then pound to even thinness with a meat mallet. Keep those tenderloins that you removed and toss them in the marinade too. 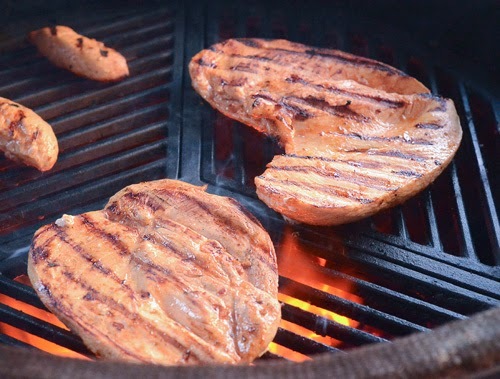 They cook in just a few minutes and make great treats for the grill master. 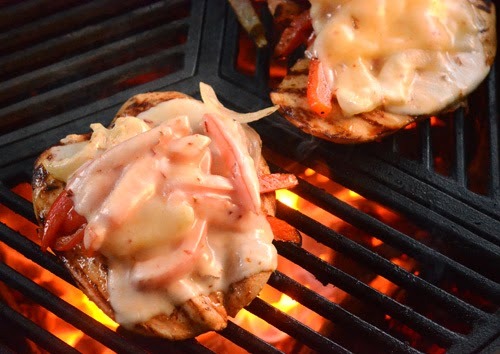 When grilling cheeseburgers or a cheese topped item like this, I sometimes steal a page from the short order cooks and cover the chicken with a wok lid to help melt the cheese quickly. Melted and gooey, ready to come off. These can be huge depending on the size of the breast. The other one was so big that we split it between two sandwiches. 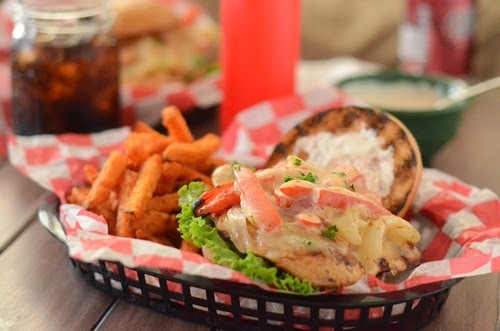 I found that using a fajita marinade for a grilled chicken sandwich puts some punch in my lunch, we liked this. I also liked the jalapeno-white cheddar cheese more than the regular pepper-jack cheeses that I buy. The texture was smoother and the taste is more balanced. When it comes to national brands, I'm usually a Sargento guy but this is a good product by Kraft. [Standard Disclaimer] I have no affiliation with Kraft or Lenny's, paid retail price, and received no compensation for using it in this post.